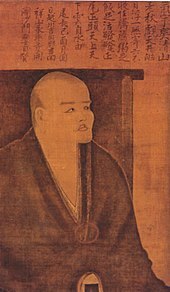 Dōgen Zenji (道元禅師; 19 January 1200 – 22 September 1253), also known as Dōgen Kigen (道元希玄), Eihei Dōgen (永平道元), Kōso Jōyō Daishi (高祖承陽大師), or Busshō Dentō Kokushi (仏性伝東国師), was a Japanese Buddhist priest, writer, poet, philosopher, and founder of the Sōtō school of Zen in Japan. Originally ordained as a monk in the Tendai School in Kyoto, he was ultimately dissatisfied with its teaching and traveled to China to seek out what he believed to be a more authentic Buddhism. He remained there for five years, finally training under Tiantong Rujing, an eminent teacher of the Chinese Caodong lineage. Upon his return to Japan, he began promoting the practice of zazen (sitting meditation) through literary works such as Fukan zazengi and Bendōwa. He eventually broke relations completely with the powerful Tendai School, and, after several years of likely friction between himself and the establishment, left Kyoto for the mountainous countryside where he founded the monastery Eihei-ji, which remains the head temple of the Sōtō school today. Dōgen is known for his extensive writing including his most famous work, the collection of 95 essays called the Shōbōgenzō, but also Eihei Kōroku, a collection of his talks, poetry, and commentaries, and Eihei Shingi, the first Zen monastic code written in Japan, among others. Dōgen was probably born into a noble family, though as an illegitimate child of Minamoto Michitomo, who served in the imperial court as a high-ranking ashō (亞相, "Councillor of State"). His mother is said to have died when Dōgen was age 7. This question was, in large part, prompted by the Tendai concept of original enlightenment (本覚 hongaku), which states that all human beings are enlightened by nature and that, consequently, any notion of achieving enlightenment through practice is fundamentally flawed. The Kenzeiki further states that he found no answer to his question at Mount Hiei, and that he was disillusioned by the internal politics and need for social prominence for advancement. Therefore, Dōgen left to seek an answer from other Buddhist masters. He went to visit Kōin, the Tendai abbot of Onjō-ji Temple (園城寺), asking him this same question. Kōin said that, in order to find an answer, he might want to consider studying Chán in China. In 1217, two years after the death of contemporary Zen Buddhist Myōan Eisai, Dōgen went to study at Kennin-ji Temple (建仁寺), under Eisai's successor, Myōzen (明全). In 1223, Dōgen and Myōzen undertook the dangerous passage across the East China Sea to China to study in Jing-de-si (Ching-te-ssu, 景德寺) monastery as Eisai had once done. In China, Dōgen first went to the leading Chan monasteries in Zhèjiāng province. At the time, most Chan teachers based their training around the use of gōng-àns (Japanese: kōan). Though Dōgen assiduously studied the kōans, he became disenchanted with the heavy emphasis laid upon them, and wondered why the sutras were not studied more. At one point, owing to this disenchantment, Dōgen even refused Dharma transmission from a teacher. Then, in 1225, he decided to visit a master named Rújìng (如淨; J. Nyōjo), the thirteenth patriarch of the Cáodòng (J. Sōtō) lineage of Zen Buddhism, at Mount Tiāntóng (天童山 Tiāntóngshān; J. Tendōzan) in Níngbō. Rujing was reputed to have a style of Chan that was different from the other masters whom Dōgen had thus far encountered. In later writings, Dōgen referred to Rujing as "the Old Buddha". Additionally he affectionately described both Rujing and Myōzen as senshi (先師, "Ancient Teacher"). To study the Way is to study the Self. To study the Self is to forget the self. To forget the self is to be enlightened by all things of the universe. To be enlightened by all things of the universe is to cast off the body and mind of the self as well as those of others. Even the traces of enlightenment are wiped out, and life with traceless enlightenment goes on forever and ever. Myōzen died shortly after Dōgen arrived at Mount Tiantong. In 1227, Dōgen received Dharma transmission and inka from Rujing, and remarked on how he had finally settled his "life's quest of the great matter". Dōgen returned to Japan in 1227 or 1228, going back to stay at Kennin-ji, where he had trained previously. Among his first actions upon returning was to write down the Fukan Zazengi (普観坐禅儀; "Universally Recommended Instructions for Zazen"), a short text emphasizing the importance of and giving instructions for zazen, or sitting meditation. However, tension soon arose as the Tendai community began taking steps to suppress both Zen and Jōdo Shinshū, the new forms of Buddhism in Japan. In the face of this tension, Dōgen left the Tendai dominion of Kyōto in 1230, settling instead in an abandoned temple in what is today the city of Uji, south of Kyōto. In 1233, Dōgen founded the Kannon-dōri-in in Fukakusa as a small center of practice. He later expanded this temple into Kōshōhōrin-ji (興聖法林寺). In 1243, Hatano Yoshishige (波多野義重) offered to relocate Dōgen's community to Echizen province, far to the north of Kyōto. Dōgen accepted because of the ongoing tension with the Tendai community, and the growing competition of the Rinzai-school. His followers built a comprehensive center of practice there, calling it Daibutsu Temple (Daibutsu-ji, 大仏寺). While the construction work was going on, Dōgen would live and teach at Yoshimine-dera Temple (Kippō-ji, 吉峯寺), which is located close to Daibutsu-ji. During his stay at Kippō-ji, Dōgen "fell into a depression". It marked a turning point in his life, giving way to "rigorous critique of Rinzai Zen". He criticized Dahui Zonggao, the most influential figure of Song Dynasty Chán. In 1246, Dōgen renamed Daibutsu-ji, calling it Eihei-ji. This temple remains one of the two head temples of Sōtō Zen in Japan today, the other being Sōji-ji. Dōgen spent the remainder of his life teaching and writing at Eihei-ji. In 1247, the newly installed shōgun's regent, Hōjō Tokiyori, invited Dōgen to come to Kamakura to teach him. Dōgen made the rather long journey east to provide the shōgun with lay ordination, and then returned to Eihei-ji in 1248. In the autumn of 1252, Dōgen fell ill, and soon showed no signs of recovering. He presented his robes to his main apprentice, Koun Ejō (孤雲懐弉), making him the abbot of Eihei-ji. Fifty-four years lighting up the sky. A quivering leap smashes a billion worlds. Entire body looks for nothing. Living, I plunge into Yellow Springs. Several "miraculous experiences" and "auspicious signs" have been recorded in Dōgen's life,[note 1] some of them quite famous. According to Bodiford, "Monks and laymen recorded these events as testaments to his great mystical power," which "helped confirm the legacy of Dōgen's teachings against competing claims made by members of the Buddhist establishment and other outcast groups." Bodiford further notes that the "magical events at Eiheiji helped identify the temple as a cultic center," putting it at a par with other temples where supernatural events occurred. According to Faure, for Dōgen these auspicious signs were proof that "Eiheiji was the only place in Japan where the Buddhist Dharma was transmitted correctly and that this monastery was thus rivaled by no other." Dōgen fell gravely ill on his way back from China but had no medicines that could be of use. Suddenly, an immortal appeared and gave Dōgen a herbal pill, after which he immediately became better. The master asked this deity to reveal its identity. The mysterious figure replied, “I am the Japanese kami Inari” and disappeared. The medicine became known as Gedokugan, which has been ever since been part of the Dōshō family heritage [...] Dōgen then told Dōshō that this rare and wondrous medicine had been bestowed on him by a true kami for the protection of the great Dharma, [and that] this medicine of many benefits should be distributed to temples so that they might spread the Dharma heritage. This medicine, which later became known as Gedokuen or "Poison-Dispelling Pill" was then produced by the Sōtō church until the Meiji Era, and was commonly sold nationwide as an herbal medicine, and became a source of income for the Sōtō church. The statue memorializing Dōgen's vision of Avalokiteshvara at a pond in Eihei-ji, Japan. From the single blossom five leaves uncurled: Upon one single leaf a Tathagata stood alone. Her vow to harmonize our lives is ocean deep, As we spin on and on, shouldering our deeds of right and wrong. –written by the mendicant monk Dōgen, September 26, 1242. When he was at Kōshō-ji a deva used to come to hear the Precepts and join in as an observer at the twice-monthly renewal of Bodhisattva vows. At Eihei-ji a divine dragon showed up requesting the eight Precepts of abstinence and asking to be included among the daily transfers of merit. Because of this Dōgen wrote out the eight Precepts every day and offered the merit thereof to the dragon. Up to this very day this practice has not been neglected. For zazen, a quiet room is suitable. Eat and drink moderately. Cast aside all involvements and cease all affairs. Do not think good or bad. Do not administer pros and cons. Cease all the movements of the conscious mind, the gauging of all thoughts and views. Have no designs on becoming a Buddha. Zazen has nothing whatever to do with sitting or lying down. Dōgen called this zazen practice "without thinking" (hi-shiryo) in which one is simply aware of things as they are, beyond thinking and not-thinking - the active effort not to think. The correct mental attitude for zazen according to Dōgen is one of effortless non-striving, this is because for Dōgen, enlightenment is already always present. Commitment to Zen is casting off body and mind. You have no need for incense offerings, homage praying, nembutsu, penance disciplines, or silent sutra readings; just sit single-mindedly. The primary concept underlying Dōgen's Zen practice is "oneness of practice-enlightenment" (修證一如 shushō-ittō / shushō-ichinyo). To practice the Way singleheartedly is, in itself, enlightenment. There is no gap between practice and enlightenment or zazen and daily life. Zazen is not "step-by-step meditation". Rather it is simply the easy and pleasant practice of a Buddha, the realization of the Buddha's Wisdom. The Truth appears, there being no delusion. If you understand this, you are completely free, like a dragon that has obtained water or a tiger that reclines on a mountain. The supreme Law will then appear of itself, and you will be free of weariness and confusion. Thinking that practice and enlightenment are not one is no more than a view that is outside the Way. In buddha-dharma [i.e. Buddhism], practice and enlightenment are one and the same. Because it is the practice of enlightenment, a beginner's wholehearted practice of the Way is exactly the totality of original enlightenment. For this reason, in conveying the essential attitude for practice, it is taught not to wait for enlightenment outside practice. Therefore, the very impermanency of grass and tree, thicket and forest is the Buddha nature. The very impermanency of men and things, body and mind, is the Buddha nature. Nature and lands, mountains and rivers, are impermanent because they are the Buddha nature. Supreme and complete enlightenment, because it is impermanent, is the Buddha nature. Dōgen's conception of Time-Being (Uji, 有時) is an essential element of his metaphysics in the Shōbōgenzō. According to the traditional interpretation, "Uji" here means time itself is being, and all being is time." Uji is all the changing and dynamic activities that exist as the flow of becoming, all beings in the entire world are time. The two terms are thus spoken of concurrently to emphasize that the things are not to be viewed as separate concepts. Moreover, the aim is to not abstract time and being as rational concepts. This view has been developed by scholars such as Steven Heine, Joan Stambaugh and others and has served as a motivation to compare Dōgen's work to that of Martin Heidegger's "Dasein". Recently, however, Rein Raud has argued that this view is not correct and that Dōgen asserts that all existence is momentary, showing that such a reading would make quite a few of the rather cryptic passages in the Shōbōgenzō quite lucid. Another essential element of Dōgen's 'performative' metaphysics is his conception of Perfect expression (Dōtoku, 道得). "While a radically critical view on language as soteriologically inefficient, if not positively harmful, is what Zen Buddhism is famous for," it[clarification needed] can be argued "'within the framework of a rational theory of language, against an obscurantist interpretation of Zen that time and again invokes experience.'" Dōgen distinguishes two types of language: monji 文字, the first, – after Ernst Cassirer – "discursive type that constantly structures our experiences and—more fundamentally—in fact produces the world we experience in the first place"; and dōtoku 道得, the second, "presentative type, which takes a holistic stance and establishes the totality of significations through a texture of relations.". As Döll points out, "It is this second type, as Müller holds, that allows for a positive view of language even from the radically skeptical perspective of Dōgen’s brand of Zen Buddhism." Recently in the great Sung dynasty of China there are many who call themselves "Zen masters". They do not know the length and breadth of the Buddha-Dharma. They have heard and seen but little. They memorize two or three sayings of Lin Chi and Yun Men and think this is the whole way of the Buddha-Dharma. If the Dharma of the Buddha could be condensed in two or three sayings of Lin Chi and Yun Men, it would not have been transmitted to the present day. One can hardly say that Lin Chi and Yun Men are the Venerable ones of the Buddha-Dharma. Dōgen was also very critical of the Japanese Daruma school of Dainichi Nōnin. Dogen's perspective of virtue is discussed in the Shōbōgenzō text as something to be practiced inwardly so that it will manifest itself on the outside. In other words, virtue is something that is both internal and external in the sense that one can practice internal good dispositions and also the expression of these good dispositions. While it was customary for Buddhist works to be written in Chinese, Dōgen often wrote in Japanese, conveying the essence of his thought in a style that was at once concise, compelling, and inspiring. A master stylist, Dōgen is noted not only for his prose, but also for his poetry (in Japanese waka style and various Chinese styles). Dōgen's use of language is unconventional by any measure. According to Dōgen scholar Steven Heine: "Dogen's poetic and philosophical works are characterized by a continual effort to express the inexpressible by perfecting imperfectable speech through the creative use of wordplay, neologism, and lyricism, as well as the recasting of traditional expressions". Dōgen's masterpiece is the Shōbōgenzō, talks and writings collected together in ninety-five fascicles. The topics range from monastic practice, to the equality of women and men, to the philosophy of language, being, and time. In the work, as in his own life, Dōgen emphasized the absolute primacy of shikantaza and the inseparability of practice and enlightenment. Dōgen also compiled a collection of 301 koans in Chinese without commentaries added. Often called the Shinji Shōbōgenzō (shinji: "original or true characters" and shōbōgenzō, variously translated as "the right-dharma-eye treasury" or "Treasury of the Eye of the True Dharma"). The collection is also known as the Shōbōgenzō Sanbyakusoku (The Three Hundred Verse Shōbōgenzō") and the Mana Shōbōgenzō, where mana is an alternative reading of shinji. The exact date the book was written is in dispute but Nishijima believes that Dogen may well have begun compiling the koan collection before his trip to China. Although these stories are commonly referred to as kōans, Dōgen referred to them as kosoku (ancestral criteria) or innen (circumstances and causes or results, of a story). The word kōan for Dogen meant "absolute reality" or the "universal Dharma". Lectures that Dōgen gave to his monks at his monastery, Eihei-ji, were compiled under the title Eihei Kōroku, also known as Dōgen Oshō Kōroku (The Extensive Record of Teacher Dōgen's Sayings) in ten volumes. The sermons, lectures, sayings and poetry were compiled shortly after Dōgen's death by his main disciples, Koun Ejō (孤雲懐奘, 1198–1280), Senne, and Gien. There are three different editions of this text: the Rinnō-ji text from 1598, a popular version printed in 1672, and a version discovered at Eihei-ji in 1937, which, although undated, is believed to be the oldest extant version. Another collection of his talks is the Shōbōgenzō Zuimonki (Gleanings from Master Dōgen's Sayings) in six volumes. These are talks that Dōgen gave to his leading disciple, Ejō, who became Dōgen's disciple in 1234. The talks were recorded and edited by Ejō. The earliest work by Dōgen is the Hōkojōki (Memoirs of the Hōkyō Period). This one volume work is a collection of questions and answers between Dōgen and his Chinese teacher, Tiāntóng Rújìng (天童如淨; Japanese: Tendō Nyojō, 1162–1228). The work was discovered among Dōgen's papers by Ejō in 1253, just three months after Dōgen's death. Fukan-zazengi (普勧坐禅儀, General Advice on the Principles of Zazen), one volume; probably written immediately after Dōgen's return from China in 1227. Bendōwa (弁道話, "On the Endeavor of the Way"), written in 1231. This represents one of Dōgen's earliest writings and asserts the superiority of the practice of shikantaza through a series of questions and answers. Eihei shoso gakudō-yōjinshū (Advice on Studying the Way), one volume; probably written in 1234. Tenzo kyōkun (Instructions to the Chief Cook), one volume; written in 1237. Bendōhō (Rules for the Practice of the Way), one volume; written between 1244 and 1246. The concept of oneness of practice-enlightenment is considered so fundamental to Dōgen's variety of Zen — and, consequently, to the Sōtō school as a whole — that it formed the basis for the work Shushō-gi (修證儀), which was compiled in 1890 by Takiya Takushū (滝谷卓洲) of Eihei-ji and Azegami Baisen (畔上楳仙) of Sōji-ji as an introductory and prescriptive abstract of Dōgen's massive work, the Shōbōgenzō ("Treasury of the Eye of the True Dharma"). Though Dogen emphasised the importance of the correct transmission of the Buddha dharma, as guaranteed by the line of transmission from Shakyamuni, his own transmission became problematic in the third generation. In 1267 Ejō retired as Abbot of Eihei-ji, giving way to Gikai, who was already favored by Dōgen. Gikai introduced esoteric elements into the practice. Opposition arose, and in 1272 Ejō resumed the position of abbot. Following Ejō's death in 1280, Gikai became abbot again, strengthened by the support of the military for magical practices. Opposition arose again, and Gikai was forced to leave Eihei-ji. He was succeeded by Gien, who was first trained in the Daruma-school of Nōnin. His supporters designated him as the third abbot, rejecting the legitimacy of Gien. Senne, another commentator of the Shōbōgenzō. Jakuen, a student of Rujing, who traced his lineage "directly back the Zen of the Song period", established Hōkyō-ji, where a strict style of Zen was practised. Students of his played a role in the conflict between Giin and Gikai. A notable successor of Dogen was Keizan (瑩山; 1268–1325), founder of Sōji-ji Temple and author of the Record of the Transmission of Light (傳光錄 Denkōroku), which traces the succession of Zen masters from Siddhārtha Gautama up to Keizan's own day. Together, Dōgen and Keizan are regarded as the founders of the Sōtō school in Japan. ^ a b c Bodiford 2008, p. 32. ^ a b Faure 2000, p. 92. ^ a b c Faure 2000. ^ a b c d e f Williams 2005. ^ a b c d e f g MacPhillamy 1997. ^ a b c Kato 1994. ^ a b DeVisser 1923. ^ a b Eihei-ji Temple Staff 1994. ^ a b Dōshū & 1969-70. ^ Faure 2000, p. 93. ^ a b Williams 1998. ^ a b c Jōkin 2001. ^ Principles of Zazen Archived 16 December 2015 at the Wayback Machine; tr. Bielefeldt, Carl. ^ "Fukanzazengi: Universally Recommended Instructions for Zazen" (PDF). Zen Heart Sangha. ^ collcutt, Martin (1996). Five Mountains: The Rinzai Zen Monastic Institution in Medieval Japan. Harvard University Asia Center. pp. 49–50. ISBN 978-0674304987. ^ Cf. Kim (2004) and more systematically based on a theory of symbols Müller (2013); reviewed by Steffen Döll in Philosophy East & West Volume 65, Number 2 April 2015 636–639. ^ Döll (2015), 637, cf. Müller (2013), p. 231. ^ Döll (2015), p. 637. ^ Mikkelson, Douglas (2006). "TOWARD A DESCRIPTION OF DOGEN'S ¯ MORAL VIRTUES". Journal of Religious Ethics. 34 (2): 225–251. doi:10.1111/j.1467-9795.2006.00267.x. Retrieved 15 July 2014. ^ See Kim (1987), Appendix B, pp. 234–237, for a more complete list of Dōgen's major writings. Abe, Masao (1992). Heine, Steven (ed.). A Study of Dōgen: His Philosophy and Religion. Albany, NY: SUNY Press. ISBN 978-0-7914-0838-4. Bodiford, William M. (2008). Soto Zen in Medieval Japan (Studies in East Asian Buddhism). University of Hawaii Press. ISBN 978-0-8248-3303-9. Dumoulin, Heinrich (2005a). Zen Buddhism: A History. Volume 1: India and China. World Wisdom Books. ISBN 9780941532891. Dumoulin, Heinrich (2005b). Zen Buddhism: A History. Volume 2: Japan. World Wisdom Books. ISBN 9780941532907. Heine, Steven (1994). Dogen and the Koan Tradition: a Tale of Two Shobogenzo Texts. Albany, NY: SUNY Press. ISBN 978-0-7914-1773-7. Heine, Steven (1997). The Zen Poetry of Dogen: Verses from the Mountain of Eternal Peace. Boston, MA: Tuttle Publishing. ISBN 978-0-8048-3107-9. Heine, Steven (2006). Did Dogen Go to China? What He Wrote and When He Wrote It. New York, NY: Oxford University Press. ISBN 978-0-19-530592-0. Kim, Hee-jin (2004) [1975, 1980, 1987]. Eihei Dogen, Mystical Realist. Wisdom Publications. ISBN 978-0-86171-376-9. Kohn, Michael H. (1991). The Shambhala Dictionary of Buddhism and Zen. Boston, MA: Shambhala Publications. ISBN 978-0-87773-520-5. Leighton, Taigen Dan; Visions of Awakening Space and Time: Dogen and the Lotus Sutra. New York: Oxford University Press, 2007. ISBN 978-0-19-538337-9. Leighton, Taigen Dan; Zen Questions: Zazen, Dogen and the Spirit of Creative Inquiry. Boston: Wisdom Publications, 2011. ISBN 978-0-86171-645-6. Leighton, Taigen Dan; Okumura, Shohaku; tr. Dogen's Extensive Record: A Translation of the Eihei Koroku. Boston: Wisdom Publications, 2010. ISBN 978-0-86171-670-8. Leighton, Taigen Dan. Dogen's Pure Standards for the Zen Community: A Translation of Eihei Shingi. Albany: State University of New York Press, 1996. ISBN 0-7914-2710-2. McRae, John (2003). Seeing Through Zen. Encounter, Transformation, and Genealogy in Chinese Chan Buddhism. The University Press Group Ltd. ISBN 9780520237988. Müller, Ralf (2013). Dōgens Sprachdenken: Historische und symboltheoretische Perspektiven [Dōgen's Language Thinking: Systematic Perspectives from History and the Theory of Symbols] (Welten der Philosophie [Worlds of Philosophy]). Freiburg: Verlag Karl Alber. ISBN 9783495486108. Ōkubo, Dōshū (1966). Dōgen Zenji-den no kenkyū [道元禅師伝の研究]. Chikuma shobō. Tanahashi, Kazuaki (tr. ); Loori, Daido (comm.) (2011). The True Dharma Eye. Shambhala Publications. ISBN 978-1590304747. Yasutani, Hakuun (1996). Flowers Fall: a Commentary on Zen Master Dōgen's Genjokoan. Boston, MA: Shambhala Publications. ISBN 978-1-57062-103-1. Wikimedia Commons has media related to Dogen.